VISTA is a moderate-framed, high-capacity, easy-fleshing bull who is loaded with maternal value from both sides of his pedigree. He is sired by Milk Trait Leader TORRINGTON and his mother is a very easy-fleshing, high-capacity daughter of Milk Trait Leader MAC LENNOX. She is best known as the mother of MAC STERLING SILVER 43S, herdsire for Panther Country Salers of Leigh, NE and the $10,000 top selling bull of our 2007 sale. VISTA is one of the lightest birth weight bulls in the sale offering with a 75 pound birth weight and birth ratio of 82. 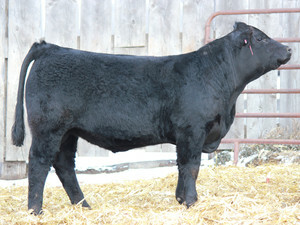 His appearance is reminiscent of our great herdsire BEV MASTERPIECE 110H who also appears on both sides of his pedigree.